Score the fat into about 1 cm (½ inch) large cubes with a sharp knife. Avoid cutting into the meat. Rub salt, pepper and thyme into the meat. Let it stand and marinate for a few hours and until it cools. Light the grill 1/2 an hour until it must be ready for use. You should only use one charcoal fuel holder. If you use both holder, the meat will not be braised in the same way. A single charcoal holder results in a grilling temperature at about 150°C (300°F). This is not quite the temperature for a slow roast, but the nice smoky grill flavor compensates very well for it. Please note that a grill is colder in winter than in summer, so cooking times may vary quite a bit. Place the charcoal fuel holder on one side of the grill. Place the meat in the grill with the rib side pointing against the hot coals. As far away from the coals as possible. The bones need more heat than the rest. If the meat is not brown enough when it is nearly done, turn fat/skin side toward the coal for the remaining roasting time. Throw a few sprigs of rosemary into the coals every hour. It provides a wonderful mild smoke flavor. Also, add more coal if necessary. If you like a very smoky flavor, you can place a log of hardwood, beech or birch on the grill. Just above the charcoal fuel holder, that will make it smoke plenty. 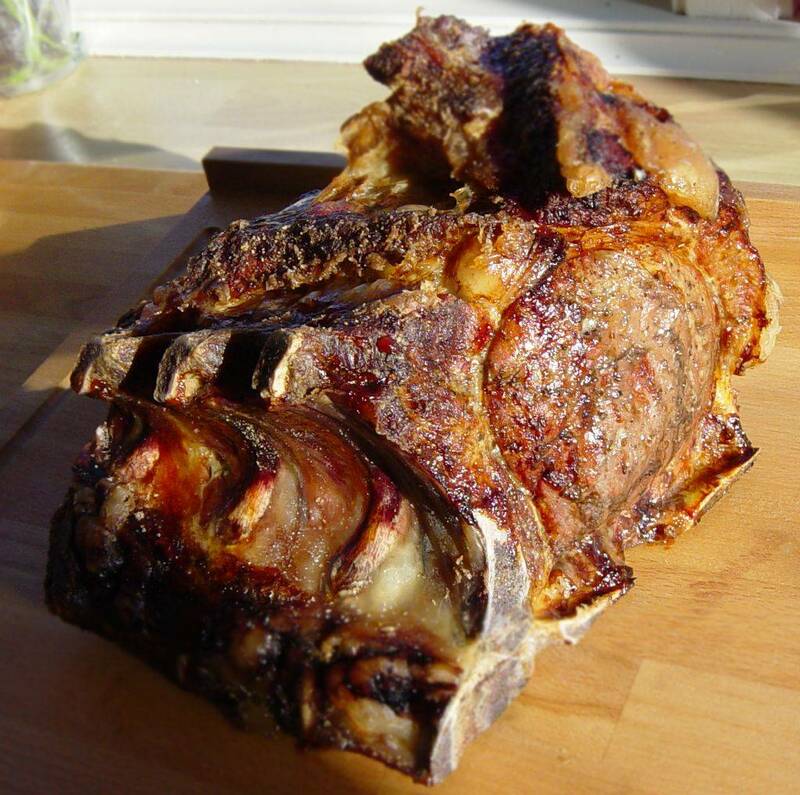 Grill the meat for about 4 hours until it has an internal temperature of 55°C to 60°C (130°F to 140°F) degree. 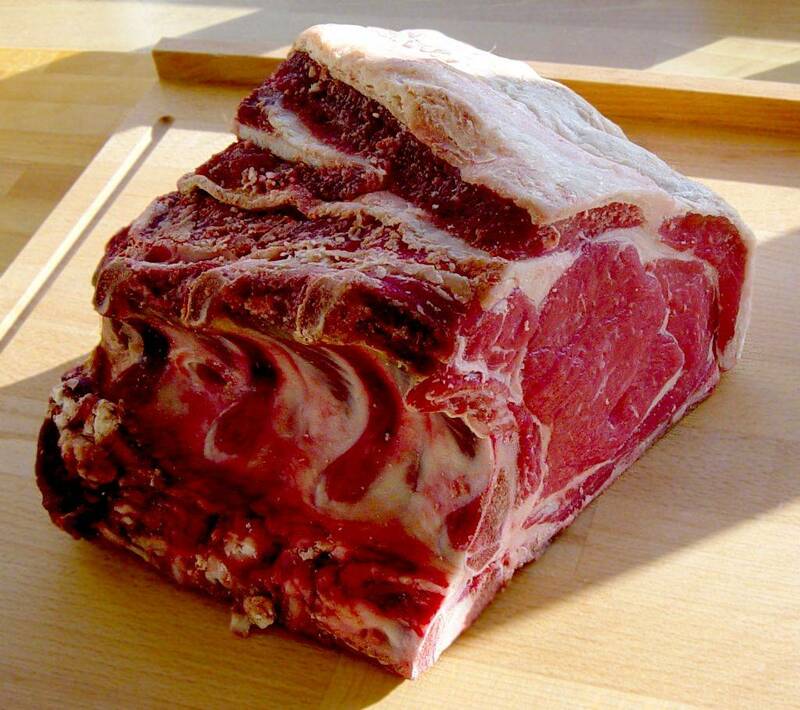 A whole prime rib is quite a decent piece of meat. Big and juicy. The size makes it somewhat difficult to cook. But on a regular grill is actually very easy. I use a 57 inch Weber grill, like most other Danes. Read more about slow roasting in the article about it.